Let's practice our abstraction skills by simplifying concepts in Calculus. Last time, we saw how abstraction simplifies ideas. After removing enough detail, a photo of lions turns into the notion of quantity (where n happens to be 3 in this case). Let's apply this to a function like $f(x) = x^2$. What's the simplified essence? The changes to the circle are the simplest, with a small arc being added. Like the lion scenario above, we have a unique representation of each change ("three lion icons"). Let's make the changes generic (three lines) by finding a common format. Here, we "melt down" each change until it resembles a straight line. 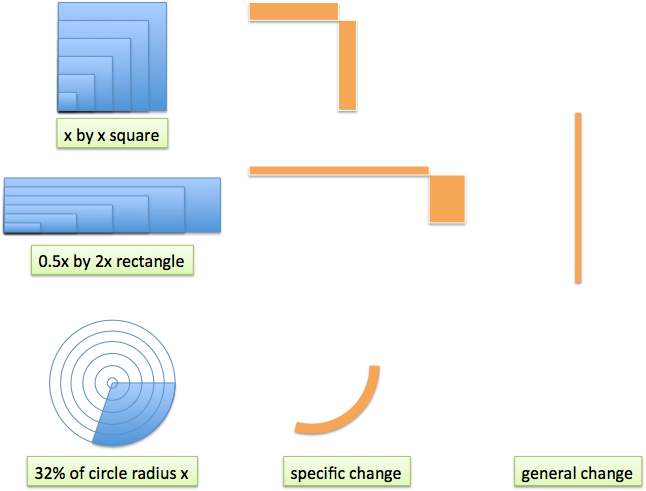 Because the square, rectangle, and circle all represent $x^2$, the same line can describe the changes they undergo. Neat! The orange "change line" is actually a transition between a starting and ending position. If we represent the start and end as blue dots, the height of the line is the amount of change between them. Notice how we make an angled line as well: the input change (blue line) and output change (orange line) trace out the rate of change (green line). Rather than picking specific starting and endpoint positions, graph every position (blue curve) and every rate of change (green line at each point). The blue curve actually generates the green line: at any point, we can draw the tangent line and see the "change angle" to the next neighbor. Here's where I get excited. On a graph, we're used to literal representations: we need a bigger line to represent a bigger change. But an angle (a certain ratio of height:width) represents every number in the same amount of space! By using an angle, we've curled the number line into a format that fits into any space. Even a giant number like 10,000,000,000 can be written with the same effort as "1". Must bigger numbers take up more room? 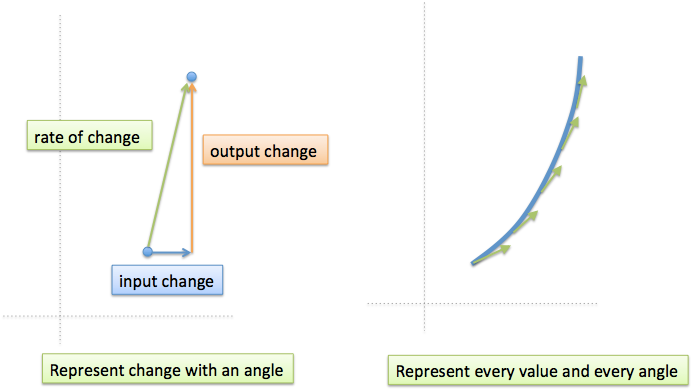 We have a clean abstraction: The curve shows every possible scenario, and the angle quantifies the rate of change. In a way, the curve "writes down" its rate of change at every point. Yowza. Maybe we discussed this in class, but I didn't think of it this way until trying to abstract each step. This was a peek into an organic "aha-finding" technique: start with a specific idea, keep generalizing, and see what insights emerge.